There is a very clear connection between the number of pigs in a municipality and the number of infected humans with the dangerous pig bacteria, MRSA398. The number of infected people with the dangerous pig bacteria is 13 times higher if you are living in a municipality with more than 400,000 pigs, than for people who live in a municipality with few pigs. This conclusion is drawn by Ingeniøren magazine after calculations of the number of pig bacteria in Danish municipalities, which the authorities have revealed to Investigative Reporting Denmark on the basis of a freedom of information request. 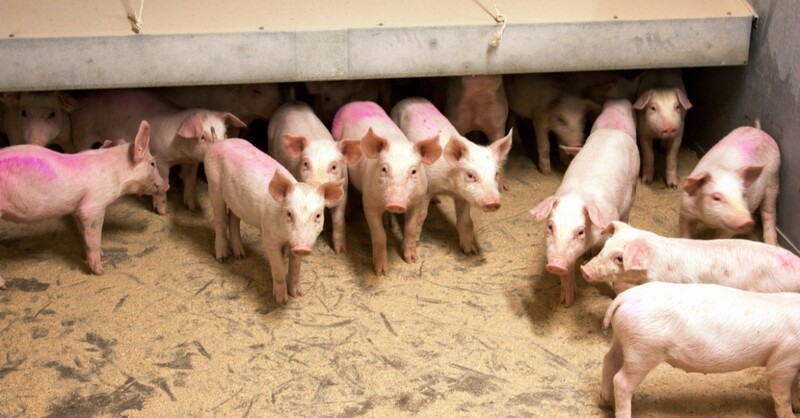 Humans infected with pig-MRSA in 2012 and 2013 in Danish municipalities. Black is the 3 highest numbers of infections in Danish municipalities. The map shows that the spread of the dangerous bacteria is a problem especially in Jutland. Calculations by Ingeniøren conclude that in municipalities with more than 400,000 pigs, there were 59.1 persons per 100,000 in 2012 and 2013 carrying the bacteria or getting ill because of it. As a comparison: this is only the case for 4.4 persons per 100,000 in municipalities with less than 100,000 pigs. – It is important to investigate the indirect paths of infection, if you want to do more to stop the spread. It is very clear. When the reservoir of the bacteria is big with many pigs, then the risk of getting infected by meat, slurry or air rises, says Frank Aarestrup to Ingeniøren. He is a professor in epidemiology at the Danish Technical University, DTU, and expert in spreads of resistant bacteria. The American Veterinary Association points out that MRSA outbreaks have occurred via food contaminated by infected food handlers, but this is very uncommon, and this risk can be prevented by proper pasteurization and food handling. To date, there have been no confirmed cases of food-borne MRSA infection from animals, they write. Ingeniøren and a Danish newspaper, Ekstra-Bladet, ran the stories on the basis of numbers from Investigative Reporting Denmark Monday the 30th of June. Afterwards, it was picked up by other news outlets in Denmark, who looked into the specific dangers in high-risk municipalities. The municipality of Sønderborg has the highest number of infections, with 69 cases in 2012 and 2013, followed by the municipality of Hjørring with 56 cases. Third is the municipality of Brønderslev with 34 cases. The number of MRSA398-infected people in Denmark rose from 12 in 2007 to 643 in 2013. From being a very small part of all MRSA-infection, the pig version in 2013 counted for nearly one third (31 pct.) of all MRSA-infection in Denmark, according to Ekstra-Bladet. The association for Danish farmers, Landbrug og Fødevarer, criticizes the calculation from Ingeniøren. The farmers association look only on the year 2013 instead of 2012 and 2013. They divide the country in 11 areas instead of 98 municipalities. They include all cases of MRSA and then withdraw pig-MRSA, where the infected has a relation to a pigfarm, while Ingeniøren looked on all cases of pig-MRSA and not other types of MRSA. Doing all this the organisation can claim it’s safer on the countryside to avoid MRSA compared to people living in the area around the capitol Copenhagen.